Prairie Avenue House Museums (PAHM) engages diverse audiences in exploring urban life and design through the preservation and interpretation of Glessner House and Clarke House museums and the Prairie Avenue Historic District. Daily life on the urban frontier and the "upstairs/downstairs" world of Gilded Age Chicago; reform gothic cabinetry and flow blue china; the massiveness of Richardsonian Romanesque and the symmetry of Greek Revival; gender roles in the 19th century and the growth of Chicago as an industrial giant -- these are just some of the items, ideas, and issues you'll learn about when you step back in time with a visit to the Prairie Avenue District for tours of the Clarke and Glessner Houses. 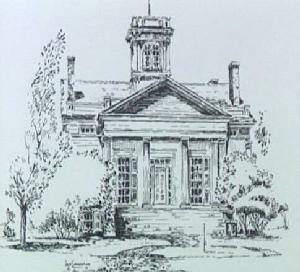 Clarke House is the City's oldest building and its only Greek Revival structure. The Clarke family, who built the home in 1836, lived a pioneer existence in the early days of "boom and bust" Chicago. From 1941-1977 Clarke House was home to Bishop Louis Henry Ford and the St. Paul Church of God in Christ. With its diverse history, Clarke House not only provides a glimpse into life on the the prairie, but holds within its walls the entire panorama of the urban experience. The Clarke House is a Chicago Landmark and is on the National Register of Historic Places. It is owned by the City of Chicago and curated and managed by Prairie Avenue House Museums. Glessner House National Historic Landmark, designed by H.H. Richardson and built in 1887, has been called "the perfect urban residence." Home to John and Frances Glessner--cultural leaders during Chicago's Gilded age -- the house's design is a radical departure from traditional Victorian architecture. 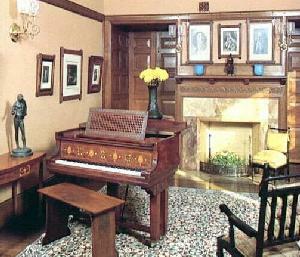 Upon entering the fortress-like structure, the visitor is greeted by a warm, oak-paneled English Arts and Crafts interior that boasts wallcoverings by Morris and Co. Glessner House is a treasure-trove of decorative art and a historical document that tells the tale of life for the privileged, and their servants, in the late Victorian Era. Glessner House is owned and operated by Prairie Avenue House Museums. 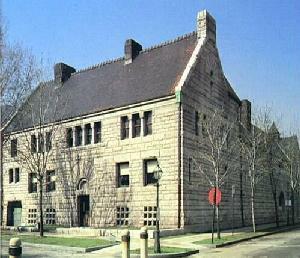 Both Clarke and Glessner House are open for docent-guided tours Wednesday-Sunday. Clarke Tours are at noon, 1 and 2 pm; Glessner Tours at 1, 2, and 3 pm. Admission is $8 for both houses ($6 students/seniors) or $5 for one house ($4 students/seniors). On Saturdays from May-October visitors can also take the guided walking tour of the Prairie Avenue Historic District. Walking tour is $4 ($3 students/seniors). The Clarke House collections include a wide array of early nineteenth century period furniture and decorative objects. Clarke House collections are owned by The National Society of Colonial Dames in America in The State of Illinois. Glessner House contains a near-complete collection of original furnishings and decorative objects. Among the Glessner family's extraordinary objects are Chicago's largest collection of Emil Galle glass and the largest array of Isaac Scott pieces in the world. William DeMorgan ceramics, Morris and Co. textiles, and a magnificent collection of Steel Engravings also grace the mansion. PAHM is located on the corner of 18th Street and Prairie Avenue, just 2 blocks east of Michigan Avenue south of the Loop. CTA buses 1, 3, and 4 from Michigan Avenue all stop at the corner of 18th Street and Michigan Avenue. Chicago, Illinois. By Henry Hobson Richardson, ca 1887. Designed 1886 by Henry Hobson Richardson. 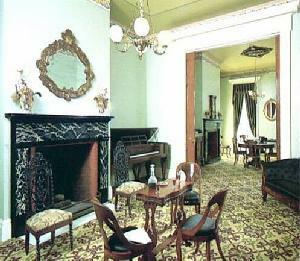 Used as music room by the Glessner's. Case of Steinway piano of 1887 designed by Francis Bacon, and made by A. H. Davenport Company, Boston. Chairs by Henry Brothers, New York. Chicago, Illinois. Built in 1836 for hardware merchant Henry B. Clarke, this house is the oldest building standing in Chicago.